How can I set the time and frequency of my posts? You can set the time of the posts for a campaign from Edit Schedule in the Marketing Plan screen. 2. Go to the Marketing tab in the left column and select the campaign type that you'd like to create - Product Sale / Daily Deal / Coupon / Auto-Pilot. 4. 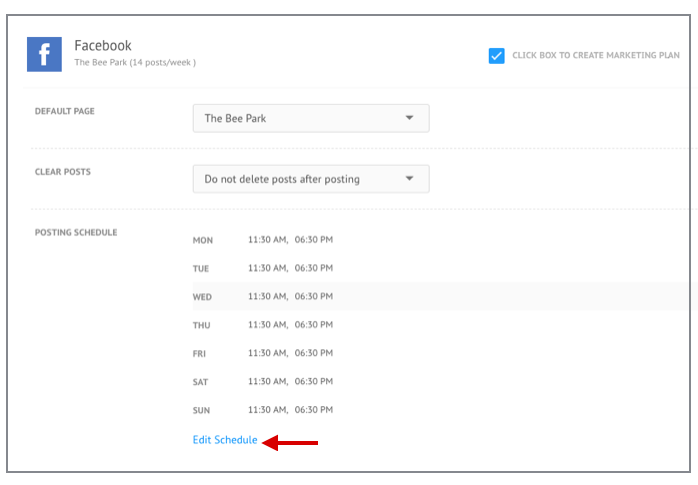 Select the social channel and then click on Edit Schedule in the left column. 5. Add / remove the post time. If you don't want to send out any posts on a particular day, just remove all the time options for it. Click on Done once you're through making edits. 6. The Calendar section will display the time at which your posts will go out. If you want this time preference for your future campaigns as well, click on Save these settings for future campaigns. Click on Create Marketing Plan once you're through making edits.